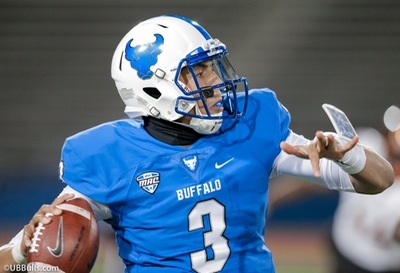 Since the University at Buffalo became an FBS level school, they are off to perhaps their best season ever. They sit with a 9-1 record with two more regular season games to be played. While it’s not yet official, UB has just about locked up the MAC East Division by virtue of Miami beating Ohio this past Wednesday night. All Buffalo has to do is win one of their final two games of the regular season. Those games are at Ohio and at Bowling Green. The Bulls have to hope that the Miami loss took any wind in the sails the Bobcats may have had. Still Ohio can be a difficult place to play at when they meet next Wednesday in Athens, Ohio. The following week in Bowling Green, Ohio the Bulls take on the now 1-8 Falcons. To date, Bowling Green has given up 417 points, so it is a safe bet that Buffalo will win that game and meet Northern Illinois in the MAC Championship Game next month in Detroit on November 30th. Northern Illinois will be the most difficult opponent the Bulls have faced since Army. While they lost three of their first four games, those losses came to teams that are very good FBS level teams. Iowa Beat Northern 33-7, Utah won 17 – 6 and Florida State easily beat the Huskies 37-19. Since then Northern has run off six wins in a row including a win over BYU in Provo on October 27th. Northern hasn’t put up the overall yardage that UB has but they have a balanced attack having passed for 1384 yards and run for another 1802 yards. Their offensive line is big and physical and is led by senior NFL prospect Max Scharping, who at 6’6 – 322 has legitimate NFL size. If UB wins both of their final two games or even splits them they will need two things to get to a good Bowl game. Obviously they need to win the MAC Championship Game but they will also need huge fan support at that game. Bowl committees not only look at a team’s record when choosing a team for their Bowl Game but also fan support. How much of a school’s fan base will buy tickets to the Bowl Game? By looking at attendance at UB home games, that can be a difficult answer for a Bowl Committee to come up with. Trust me, a lesser team with a stronger fan base can get the nod over UB if they don’t get good support at the MAC Championship game. I was at the MAC Championship Game in 2008 when UB played Ball State. Granted Ball State had a much shorter drive coming from the Fort Wayne, Indiana area but still outnumbered UB fans by a two or three to one ratio. It’s only a four to five hour drive to get to Detroit depending on how you make the trip but there is no reason UB can and should have a strong presence at the Championship Game. If that happens and UB wins the Championship they will make a strong case to get themselves in a better game than the Dollar General Bowl in Mobile, Alabama. Granted the pressure is on the team to win these games, but the pressure is also on the fans to support this team. This may be the best UB team in history and the team has four or five legitimate NFL prospects on the team. Let’s get out and give them the support they are due.